This Photo Tag was tagged to me by my good friend Annalou. She has this cutie dog named Bones and she is happily married to her hubby and she resides in the land of Honey for almost three years now. We have not met personally, yet but we seem to be long lost friends already in the course of blogging. She tagged me regarding my tenth photo in my photo file folder. Thanks for this tag friend. This photo is the tenth in my photo folder. I have recently reformated my computer and I can't locate where the back up files for my other photo folders are located as of this time. This shot was taken two weeks ago in an island during our office conference. 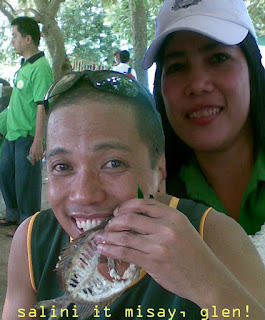 This one is a cropped picture of me and my officemate whom I snapped a shot while he was devouring to the bones his grilled fish. He was so amusing because he had his fish intact as he ate it like that. My picture was cropped to him as I was trying to learn how to use photoshop. This cropping was done by the computer technician who was demonstrating how to do the cropping. Salini it misay, glen in the pic means, spare some for the cats, glen! hahahah.. sarap siguro ng grilled fish na yan, parang danggit or kitong.. hehehe..
Hello there ate melds ! We got back since Sunday but wasn't able to visit blogs till now. They got sick (diarrhea) except me. We actually brought our son to the hospital today because he is fevered (still is till now.). I would like to thank you all for the wonderful and encouraging words you said and left at my blogs. For the sympathy and prayers, and for those who shared their blessings to the family! May God bless you all for your compassionate hearts!